With the weather getting warmer, Hi-Wire Brewing is excited to announce the release of their summer seasonals, and two new specialty beers. Customers will soon be able to enjoy four releases from Hi-Wire Brewing including specialties Man Eater Double IPA and Blackberry Sour, and seasonals Aerialist Summer Lager and Uprisin’ Hefeweizen. 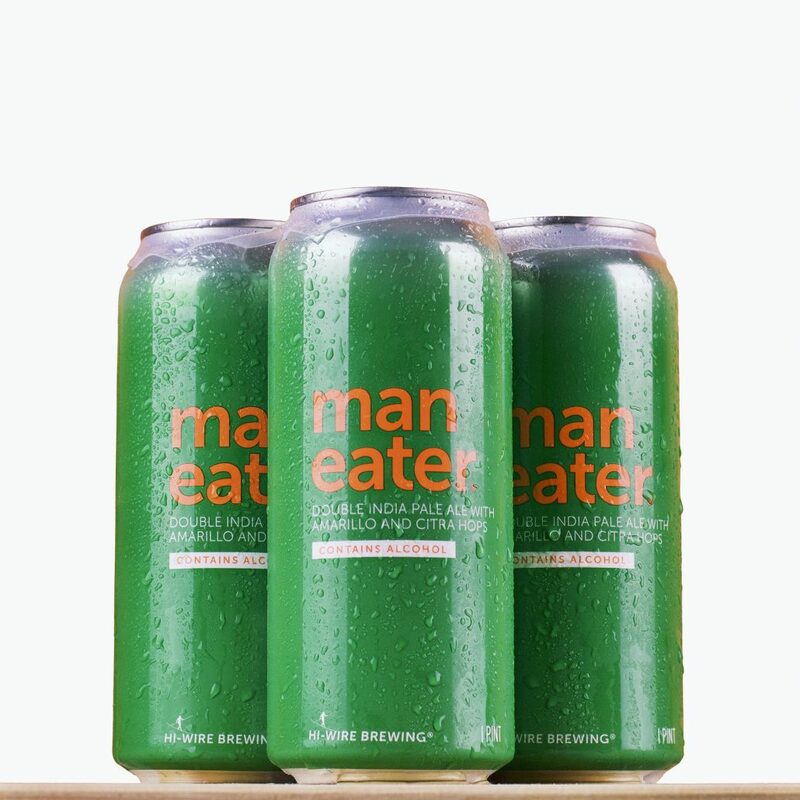 Man Eater Double IPA (8.3% ABV) triumphantly returns in 4-packs of 16oz cans. Hopped at a rate of 3.5 pounds per barrel, this is a seriously hopped Double IPA. Man Eater marries Amarillo’s spicy aromas with Citra’s classic notes of lemon zest and mandarin orange. These big hop aromas accompany a spicy, citrusy, floral flavor with a warming alcohol finish. Man Eater is now available in both of Hi-Wire’s taprooms and will see limited distribution in Hi-Wire Brewing’s footprint. The next release from Hi-Wire Brewing’s Sour & Wild Ale program is a Blackberry Sour (8.2% ABV) in 750ml bottles, available Saturday, April 1st at 12pm from their South Slope Speciality Brewery. From stainless, to a blend of rye whisky, red wine, and North Carolina rum barrels before being bottled conditioned, this beer boasts a total fermentation time of 18 months. Think blackberry jam, brett, and oak in this balanced and drinkable ale. The Aerialist Summer Lager (5.5% ABV), Hi-Wire Brewing’s seasonal lager, pairs two styles of beer: A German-Style Lager and an American IPA. Brewed with their house lager yeast and hopped with Citra, Mandarina Bavaria, and Huell Melon, this drinkable summer beer has big hop flavors of citrus and tropical fruit which give way to more subtle flavors of peach, melon, and apricot with a smooth, balanced finish. “This beer combines the profiles of two of my favorite styles, lagers and IPAs,” says Hi-Wire’s Head Brewer, Luke Holgate. “The light grain bill and clean lager fermentation profile create the perfect canvas for these hops to shine. This is a refreshing, warm-weather beer with a bite.” This beer will hit shelves the week of April 3rd in six-packs across Hi-Wire’s entire distribution footprint (North Carolina, South Carolina, Tennessee, Eastern Georgia, and Ohio), and will also be available on draft in numerous bars and restaurants across their territories through July. Hi-Wire Brewing’s summer ale seasonal, Uprisin’ Hefeweizen (5% ABV), was brewed with North Carolina grown wheat from Riverbend Malt House located in Asheville, NC. This traditional German Hefeweizen is all about the yeast, with ester notes of banana backed by tones of clove, peppercorn, banana and spice that no one would expect from a traditional take on this beer. The Uprisin’ Hefeweizen will see Hi-Wire Brewing’s entire distribution footprint beginning April 14, and will be available in six-packs and on draught.